Our warm coral-pink cheek powder is your "coral blush for a tropical flush"! This shade cheers up every skin tone in seconds. I have always used brown and peach blushes because of my medium skin. I have avoided pink hued blushes over the years because I was afraid they might probably look unnatural or clownish on me (yellow undertones) but Benefit Coralista proved me wrong. Coralista, a permanent blush from the Benefit Cosmetics’ “Box O’ Powder” Collection, is a beautiful pinky coral blush with just the right amount of micro-fine golden shimmers to give you a healthy and natural looking glow. It doesn’t have any individual chunk of glitter that accentuates large pores and screams “mirrorball” under various lighting conditions. You will be amazed on how it suits many different skin tones. I apply this using a slanted brush starting from the hairline and then working it all the way in. 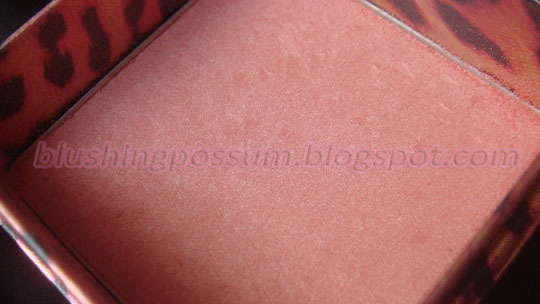 The pigmentation is average and you may find the color very subtle at first but its intensity is very buildable. Whenever I find myself using a different blush, I dab a little bit of this with a very light hand using a fan brush on the apples of my cheeks, temples and brow bones to highlight. I also use the brush that comes with it by swirling it ever so lightly on my forehead and chin to warm up my face. On top of a regular foundation, this lasts on me for 5-6 hours which is monumental, considering the climate here in the Philippines is hot and humid all year round (even during rainy season). I have tried using this on top of a cream blush as a base and it didn’t budge for almost 8 hours. 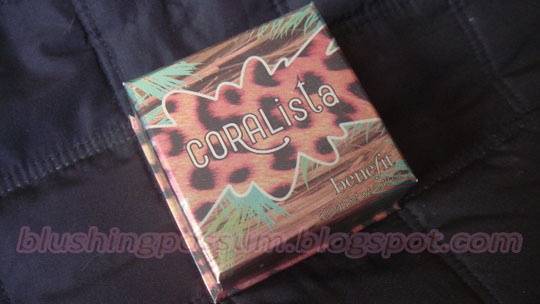 Just like any other Benefit box o’ powders, Coralista smells beautiful. It’s hard to describe how it smells because I haven’t smelt anything like it before. I’d say it’s a cross between being fruity and floral. The scent is very light and disappears the moment you apply it. I also love the cardboard packaging because it has like an inch of high sides so you basically don’t lose any of the product from tapping. 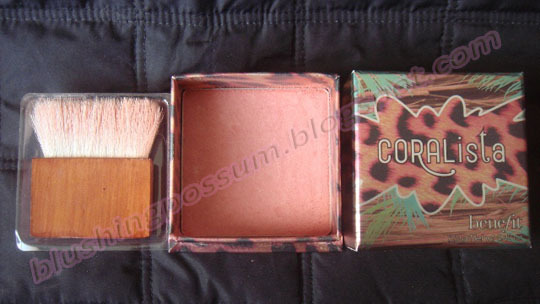 Overall, Benefit Coralista is the perfect blush + highlighter product you can get your hands on. Totally worth the investment. Did not like it. Lasted for 2 hours max! For a blush that is way too expensive, this blush really disappointed me. Aside from that, the shimmers can emphasize pores. I am now using this as an highlighter because the color is not showing on my NC32-35 skin tone. Waste of money!